As musical instrument amplifiers become more complex, the need arises to allow musicians the freedom to switch various features and effects in or out during performances. The Cliff™ range of high quality foot pedals feature single and dual models from our factory in China and our own modular foot pedal system. This allows any number of switches to be mounted into one module. Currently, demands exist for up to 7 switches in one unit, although more can be easily achieved with our design. Our switches are specifically designed for this application. Design variants can include the number and spacing of switches, coloured colored LED indicators, choice of output cable and custom screen printing. The minimum production run is 100 pieces, (1000 pieces for screened units). Units can be supplied unassembled. Standard colour color is black powder coat. See the PDF data sheet: Modular Foot Switch (opens in a new window). Rugged aluminium aluminum construction with moulded molded non-slip base and ends. Latching or momentary action push-button switches. Wiring, output cable and terminations to customers requirements, (DIN socket, D-connector, jack socket or cable). Custom artwork set-up, screen printing and labels. CKD kits for customers who want to fit their own electronics (minimum 100 pieces). Case: Black, semi-gloss, powder coated aluminium aluminum with adhesive foam feet or optional moulded molded rubber feet. Switches: DPDT on-off or DPDT momentary, (make on push down). A mixture of switches can be used. 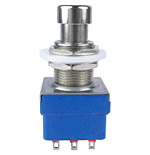 PCB mounting switches can be used if specified. Minimum lifetime 10K operations, optimum 50K. Operating temperature range -10 °C to +70 °C. LEDs: Optional. Red, yellow and green are standard and other colours colors are available on request. Customer to supply circuit details for lighting LEDs. Outputs: Cable with mono or stereo ¼″ jack plug or 3,4,5,6,7 pin DIN socket located in left or right end. Screened or unscreened cable. Also DIN socket, D-connector or jack socket. Packing: Individual carton, subject to quantity. For larger volume orders (>1000 lots) of single or double foot pedals we will usually supply from our China assembly plant with a steel body rather than aluminium. aluminum. Standard production has a cable output with a mono or stereo jack plug. CL2107C Single foot pedal kit. ON/OFF switch. CL2108C Single foot pedal kit. Momentary switch. See the data sheet Single, Double and Triple Foot Switches (opens in a new window). 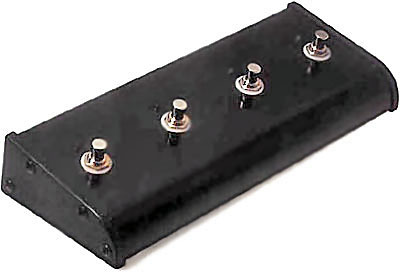 Please also see the range of Cliff™ footpedal switches.